Happy publishing day to The Vanishing Year! I am absolutely thrilled to be a part of the blog tour for Kate Moretti's new novel. I am a huge fan of domestic thriller/suspense novels and love that edge-of-your-seat-biting-your-nails feeling that they offer. I was hoping The Vanishing Year could fulfill my nail-biting needs and Moretti did not disappoint! The Vanishing Year is full of suspense, mystery, crazy twists, and a touch of romance. I was sucked in immediately and loved how the main character came across as a normal girl, even if she did have a pretty rough and twisted past. Zoe, the main character fled California and started over in New York City with a new job, new friends, a new hair do, and a new man. She met Henry who swept her off her feet and whisked her away on weekend getaways to Paris and spontaneous trips to the mountains. With every want and need taken care of, Zoe became content in their charmed life together. When Zoe decided to start digging into the mysteries of her past, she began to find things that were terrifying, confusing, and life threatening. I love when you get deep into a book and suddenly realize everyone is a suspect and no one can be trusted. Obviously, it is not a situation you want to personally be in, but when it's happening to someone else in a book, it is incredibly exciting. 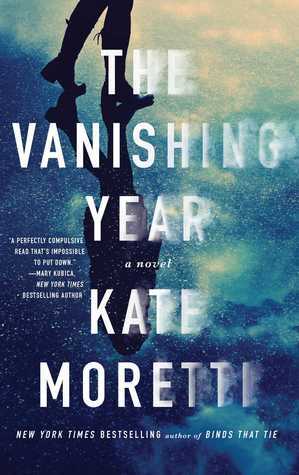 Moretti created a suspenseful and nonstop thriller in The Vanishing Year that is absolutely stand-out amazing. The novel kept me guessing with every turn of the page and left me in total shock at the end. The Vanishing Year is definitely one of my favorite reads this year and I highly recommend it!